I love problem solving. The thought of solving a problem that might change someone’s life forever is amazing. My career goal is to help develop a personalised approached to medicine. My ultimate goal is to develop a test or series of tests that can help identify the best treatment for each patient at the very beginning so they have the best outcomes possible. 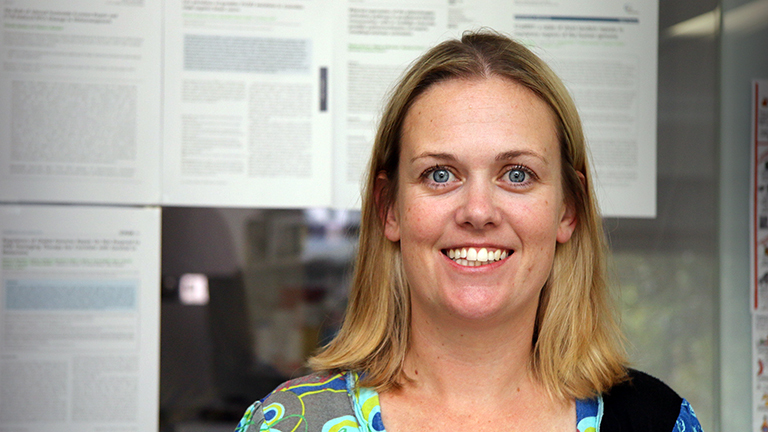 Dr. Vicki Maltby is the Multiple Sclerosis (MS) Research manager for the MS Research team at the John Hunter Hospital and a Conjoint Lecturer in the School of Medicine and Public Health, Faculty of Health and Medicine at the University of Newcastle. She completed both her BSc. and PhD at the University of British Columbia in Vancouver, Canada. Her research focus was on basic research, studying histone modifications in the budding yeast, S. cerevisiae, to improve understanding of how gene expression is regulated. In particular, she conducted research on the interaction between histone lysine methylation and acetylation in the regulation of transcription, which regulates protein production. In 2012, Dr. Maltby moved to Newcastle to study epigenetic function in autoimmune diseases at the Hunter Medical Research Institute. One year later, she was awarded a Multiple Sclerosis Research Australia and a Canadian Institutes of Health Research fellowship focused on epigenetic factors in multiple sclerosis with Prof. Jeannette Lechner-Scott. Her current area of interest is epigenetic markers in MS, particularly DNA methylation and how changes might be used as biomarkers to predict treatment response. Dr. Maltby is currently running a large multi-centre Australian study, which will be exploring the long term effects of newly approved therapy (on the PBS) for MS, called Mavenclad. As part of this study, she will be investigating long term disease outcomes, the use of multiple biomarkers, including epigenetic markers, to determine treatment efficacy and response. Improving the lives of MS patients through personalised diagnostic strategies.